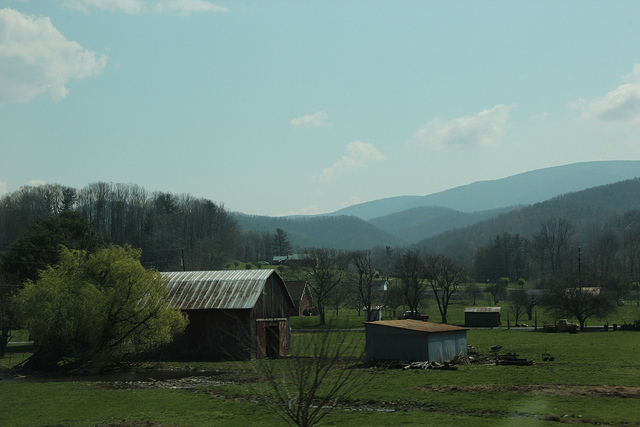 A North Carolinian view, taken by my mom during the trip. I’ve been away from the blog because of my annual appointment with Dr. Cheney on March 20th. First I was trying to rest up to get ready for it, then I was trying to recover from it. This was the fourth year I’ve gone to see him, and we’ve pretty well got the trip down to a routine now. We left on Sunday, did the drive to Charleston that day, then the second half through to Asheville on Monday, to make it as easy as possible for me. My appointment was on Tuesday, and we drove home on Wednesday. Unfortunately, my body picked the week before the trip to develop only my second cold in the course of my nearly eight-year illness. The last one was in 2005. Chimp had had it first, and we’d been not kissing each other for a couple weeks, until he seemed to be on the mend but just carrying around a lingering dry cough. At that point we decided he probably wasn’t contagious. Well, wrong. A week before we left, my throat started to hurt. And not only did I get a cold, in the process, the cold somehow found a way to kick back up that cytokine storm that I had spent five months trying to get rid of, bringing back everybody’s favorite: The feverish feeling. So I was already feeling extra crappy before we even got going. This trip is always hard, and I always seem to forget how hard it is. I suppose this is a good thing, that I forget about it after I recover from the exertion, but it’s not terribly fun to be surprised anew at how awful I feel while the whole thing is going on. One of the things I forget that I’m always reminded of by this trip is that pain is stress. I have a Norco prescription, which is Vicodin with slightly less Tylenol, and I have used it in the past to make the drive easier. When the trip arrived this year, it’d been quite a while since I’d used any Norco (I was taking it last fall to help with the IRIS, but I’m on low dose naltrexone, and you’re not supposed to mix the two). It makes me nervous to take it, because sometimes it can make my breathing feel a little suppressed, which is an unpleasant and scary feeling. So that first day I guess I thought I would try to get along with minimal painkiller (1/4 of a tablet). That was a mistake. By the time we got me into the hotel room in Charleston, enduring the drive with almost nothing to blunt the jars and swaying meant I was in awful shape and only able to communicate a word at a time (“Dinner,” “Water,” etc.). It’s miserable to be in that situation, and it was really stupid of me to get myself into it when it could have easily been averted. The other thing was that the last hour or so of that leg of the drive, there was a lot of sun coming into the vehicle because we were driving west into Charleston. I’d plastered myself with sunscreen even more than usual, as the feverish feeling meant I couldn’t bear to wear pants, and I had my eyes covered with a mask, but despite that, I kept feeling worse and worse. I don’t remember the light being such an issue in any past year, but it really did a number on me this time, and I have no idea why. Even with the mask on and my eyes closed, the light was just too much for me to handle. Thankfully, I got a pretty good night of sleep in Charleston – I slept better on this trip than I think I ever have before – and I was looking better the next morning. We got ourselves down the road to Asheville, did the room choice roulette (“I guess they must have made some notes on us last year. This is about as far from the elevator as possible.” “This suite doesn’t have a door between the room door and the bed. There’s no way it’ll be quiet enough.” “Do you hear that squeaking from the air conditioner? I know I won’t be able to sleep with that going.”) After evaluating four or so rooms, we settled in for the duration. So Tuesday was my appointment. Cheney sees one patient a day, so you show up lunchtime-ish, and when he’s finished your chart review, you’re called back. I had been really worried in the run up to this appointment about the echocardiogram. During the echo, you get some of the special gels applied to your arm to see how your system reacts. Since last year, the new bottles I’ve gotten have seemed stronger, and I’ve had to move them down my body (to my feet) and apply less of them in order not to have bothersome side effects – anxiety, palpitations, insomnia. So when we arrived and his assistant popped her head out and asked if I was going to have an echo done, I blinked and said, “I didn’t know it could be optional.” I decided I was feeling awful already, and foregoing two hours in the echo room with the machine putting off heat and the probe digging into my ribs sounded just fine to me. I assume skipping it was an option because I’m a returning patient on a stable protocol. The appointment starts out with a physical exam and vital signs, and here I got some very good news. When Dr. Cheney’s assistant weighed me, my weight was down four pounds, my fat mass down seven pounds, and my lean body mass up 3.5 pounds! This certainly makes sense, as I’ve been able to be up and around much more in the past year than in the several preceding it, and I must be building up muscle as a result. The other good news came when I went to do the Romberg test, which I’ve had trouble with in past years, toppling quickly once I close my eyes. This year I could tell that I was far steadier with my eyes closed, and was actually a bit surprised to find that I didn’t fall at all. I think this has as much to do with having improved my musculature as anything else. There were two things I didn’t manage this year that I have in years past. The first was the breath hold he usually has me do to see if I fail to desaturate. Because of how sick I was feeling, holding my breath even for the 30 seconds I have in years past sounded like a terrible idea. The second thing I failed at was having him taking my respirations while receiving oxygen. He put the cannula up to my nose and I immediately started to hyperventilate, which he’s said in the past is my body’s attempt to manage and reduce the amount of oxygen coming in. The hyperventilating made me feel anxious and I tore the cannula off within ten seconds. I just couldn’t deal. After that, it was time for our discussion of symptoms, meds, and questions. My appointment with Cheney is the one time that I’d like to be at my best, and I’m always at my worst. Getting to Asheville is obviously way more stress than normal, I’m inevitably exhausted when I show up, and my brain is never working well. I prep my symptom list, my summary of the past year, and my question list in advance, and Chimp always does a great job of speaking for me, but still, I wish I could present better than I do, because I’d like to really be able to engage in the discussion that goes on during the appointment, rather than lying there inert and occasionally volunteering a monosyllable. The exhaustion makes me emotionally fragile too, and there’s always at least one point when I dissolve into tears from the stress. This year it was the heat that did it. One of my physical difficulties is that I cannot deal with temperatures over about 71 degrees. It’s a hard limit. My body just isn’t able to cool itself effectively, and 75 degrees feels like 110. Cheney’s office has windows along one side, and I’ve had trouble in there in the past. I was hoping that because we were going in March this year (as compared to April last year and May the year before that) that the temperature wouldn’t be an issue. No such luck. Thanks, La Niña. It felt like it was roasting in there. I tried to endure it by plastering myself with cold compresses, but eventually I had to give up on that and ask to be moved out into the hallway where it was cooler, with my head sticking into his office. Nobody batted an eye at this, of course – ME/CFS limitations are well understood there. He did note my cold, and that the back of my throat was totally inflamed. I mentioned to him that it was only the second cold I’d had in the course of my nearly eight-year illness. He said he thought it was possible that the reason I got a cold – symptoms of which are of course the body’s response to a virus – was that the GcMAF treatment had moved me from somewhat immune incompetent, meaning I wouldn’t develop cold symptoms at all, to somewhat immune competent, meaning that I would. I suppose this is technically good news, but not getting colds was a pretty good superpower to have, and it’s no fun to have the symptoms of a cold on top of ME symptoms. He made some suggestions about changes I could make to my treatment plan in the short term that might help the symptoms of the cold go away faster. His suggestions were that I discontinue the MTF gel and Vitamin D, because both of those could make cytokine storms worse. He also reinforced that the wormwood extract and artesunate I’ve been using for years now are both antivirals, and should help. And speaking of cytokine storms, before the appointment, I put together this plot of the two nagalase tests I had done, one before, and one while I was on GcMAF. (Click to enlarge.) The dots on the darker line are the two tests; the lighter line is a linear extension of that trend. Dr. Cheney said that going into the use of GcMAF, he thought the aim would be to drive nagalase to zero, because zero is the normal value in healthy people. However, as patients arrived there, he found that a nagalase value below 1 appeared to coincide with the onset of a cytokine storm and regression – some cases milder, some more severe. Since then, he’s been counseling patients to stop before we get below 1. 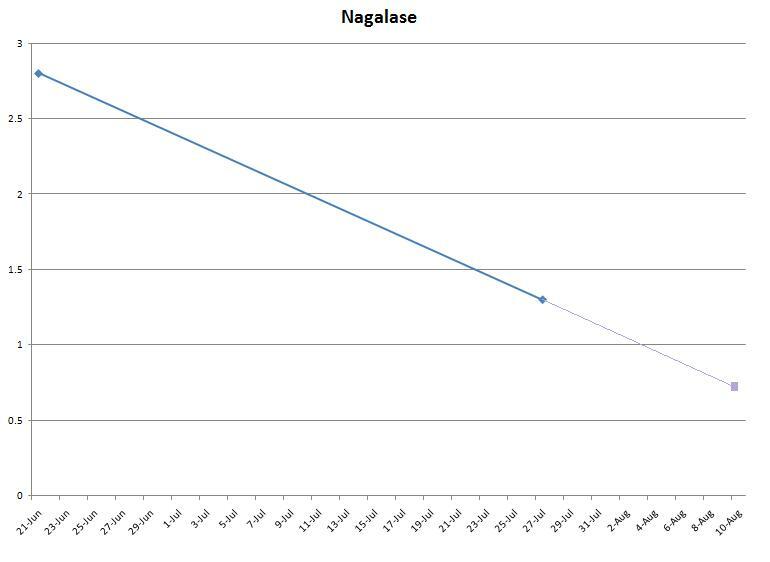 My graph definitely fit that pattern – if my nagalase had continued dropping in this roughly linear fashion (which of course, isn’t necessarily the case), it would predict that my cytokine storm would begin approximately where it did. One of my questions for him was whether it would make sense for me to go back on a low dosage of GcMAF (which several people have suggested to me) or to proceed to MAF 314. He thought MAF 314 would not be a great idea for me, as he said it’s more powerful than chemical GcMAF and more difficult to control, and would increase the likelihood of another cytokine storm. Low doses of the chemical GcMAF, which is a known quantity and strength, was in his opinion be a better idea for me. But, he said, we needed to know where my nagalase was first before embarking on that again. (I had a nagalase draw a week before we went to Asheville, so it shouldn’t be long now.) He said he thought based on my rekindled cytokine storm symptoms related to the cold that my nagalase would turn out to still be below 1. We shall see. As in years past, he noted with interest my particularly unusual sleep regimen, which I’ve written about here before. I told him that the Soma I’d added last March (which he’d prescribed for me) had saved my bacon, allowing me to knock down my use of Seroquel, and that the particular combination of things I’m on now has been giving me the best sleep I’ve had since I started needing sleep aids in 2007. He said, as he has before, that he thought he might share my protocol with other patients, since I’ve put so many years into figuring out each tiny thing that will help add up to a good night of sleep for me. And he was particularly interested in figuring out why the Soma had made such a difference – he said he planned to investigate its mechanisms. It’s always nice to leave feeling like I’ve contributed something he finds interesting and which might help other patients. Well, no wonder! Magnesium sulfate and I have a long history of not getting along. I’ve tried it in tablet, cream, and injectable forms, and all three have in the past caused tachycardia. So foregoing pants and smearing on at least double and maybe three times the amount of sunscreen I’ve used in years past probably has something to do with why I felt so terrible on the way down. I decided to skip the sunscreen and hope that Chimp’s blackout curtains would do enough to keep the light off of me so I wouldn’t burn. It did seem to work. And a little personal note: One of the few times I popped my head up on the way home, we were on U.S. 19 in West Virginia, and just passing the exit for Birch River. And I thought to myself, “Isn’t that the home of Brier Run Chevre, or is my PEM-addled mind running the initials together?” Those of you who didn’t know me in my pre-illness life might not know that I was a Whole Foods cheesemonger for five years in the 90s. And indeed, I was remembering right (link autoplays video). The Savas invited me to the farm more than once, and I never did get a chance to get out there. Their cheese was one of the ones I picked for Chimp and my wedding reception, too. I wish I were well enough that we could have stopped. My recovery from the trip has gone well. It took a few more days for the last of the cold to let go, and I noticed my brain coming back pretty well after just a couple days. The body part has taken a bit longer, but within a week I wasn’t really noticing the “I just went on a trip” post-exertional malaise any more. The one thing that’s been hanging around is the darned feverish feeling. I took some Norco for it for a few days after returning, and since then have been dealing with it by wearing just a tunic and continuing to forego pants. I don’t know if it’s caused by the cold virus or whether the stress of the trip is playing into it too, but I’m hoping it’ll abate faster than it took to do so the last time. Another five months of this would be pretty unwelcome, but if that’s to be the case I can deal with it at the level it’s at currently. This entry was posted in ME/CFS and tagged cheese, Cheney, Chimp, GcMAF, gels, Mom, nagalase, sleep, weight. Bookmark the permalink. Thanks, idiosycratic eye. Given your chosen name, that surprises me a bit. 😀 I hope it wasn’t too inconvenient. I know I love learning new words. are you saying that cheney is saying that if one stops gcmaf, then the nagalase will eventually rise back up? thanks for your great write up! very helpful. Rivka, Cheney thought my nagalase would actually stay down. I have to say, I have less faith in that than he does, but I suppose we’ll see what happens. He thought my symptoms that came along with the cold might indicate that my calcitriol was also high, and there too, I would be surprised if that were the case, because I’ve had to ingest massive amounts of Vitamin D just to stay on the low end of normal. Anyway, obviously not many of us have run this gauntlet yet, so I don’t think anyone really knows what will happen in the long term with nagalase. thanks, jocelyn, for your reply. can you say more about what cheney said about if a person were to get below 1 on nagalase? What happens, basically, is what happened to me from August to January. (I have three posts about the IRIS/cytokine storm: one, two, three. At first Cheney thought what I had was just IRIS, and that it would pass quickly, but it eventually became clear that it was more than that – it was a massive cytokine storm. So you get an extended cytokine storm, which is inflammation, and in my case it manifested as a feverish feeling, worsened fatigue, and generally worse functioning on all measures. There was another Cheney patient who got into the same situation as I did – drove his nagalase down very low before we knew that was dangerous – and after the GcMAF giving him a big rise in KPS (I think he went from 60 up to 70), he crashed badly, went down to a 30 and was bedridden for several months. Wow, a lot of this is beyond my knowledge zone. But glad you got something out of all that travel and discomfort and that it helped in some ways. As I read your descriptions of your symptoms, I can relate to the sensitivity to noise and to heat. I’ve already started panicking as it became very warm here a few weeks ago and I thought that I couldn’t survive seven months of heat — without running my a/c 24/7 which I’m trying not to do because of huge Con Edison bills. What a dilemma! Glad to see that you are recovering from the trip. Hope that you get some great cheese as a gift to yourself, even if you have to order it online and have it sent to you. Yeah, Kathy, the only reason any of this is within my knowledge zone is that I’ve gotten it reinforced many times by interacting with Cheney, reading messages he sends to our patient group, and following the discussion among said group. And there is a lot of it that I’ve encountered through that that is still beyond me! Dealing with the heat is the worst. It just feels really scary to know that you’re so dependent on the power supply. I hope for a cool summer for us all. Thanks for the sympathy and the kind words, Dev. I kept a journal a lot growing up, and blogging is just a natural extension of that. It makes it feel like it comes pretty easily. Jocelyn, thank you very much for your fascinating report on your trip to Dr. Cheney. I noticed that you suffered from the sun during the car ride, and wonder if you’ve thought of having some of your car windows tinted. When we converted an extra-long Dodge Caravan into a poor man’s ambulance for trips such as the one you just took, we had the windows professionally tinted. It made a huge difference. The company that did the work claimed that 99% of the sun’s ultraviolet rays are blocked by the thin tinted film they applied. That was nine years ago, and the film has held up perfectly. And we like that in the back of the van we can see out, but people can’t see in. Good thought, Flo. The vehicle we’re using is actually my mom’s SUV, and she may not have it much longer, but that’s certainly an option for the future. Thanks for thinking to mention that to me. It sounds like it was 19 years ago, so prices may have risen considerably, but the window tinting sounds like an excellent idea, if it’s doable and affordable. I want to chime in, as I forget to on my first post, that you do write so well. Whatever symptoms flared up due to the strenuous trip, it did not affect your writing (or else it came back quickly). It’s a pleasure to read — and it’s educational as well. Hope your overall recovery comes quickly. Thanks, Kathy. I feel like I’ve lost a good deal of my facility for writing with the cognitive decline that comes with the illness – when I look at my old writing, I have a terrible time just trying to understand it. I also used to be quite a good proofreader, and I can’t “see” many misspellings any more. They used to really jump out at me. But it’s comforting to know that I’m still making some sense to others! Thank you so much keeping us informed about your progress and what brings it about. 2)	Cheney suggested to discontinue Vit D because it could make cytokine storms worse. Alternatively he said in one of his blogs that ME people should not supplement with vit D3 – had bad readings on echocardiogram, but he said when getting the flue (at that time it was swine flue time) doses up to 2000iu of Vit D should help. How to merry these two statements? 3)	Has Dr Cheney heard about the homeopathic GcMAF which is discussed on Phoenix Rising and used by Dr Bradstead for his Autism kids. It might be more gentle but still effective for our purposes? 4)	You are very lucky that Dr Cheney prescribes Soma. It is a controlled substance and no consultant, private or NHS would prescribe it in the UK, same with Xyrem. I looked at the internet and there are a host of internet pharmacies that sell it, some without prescriptions, but you would not know what you actually getting, so too dangerous. May be it would help if Dr Cheney would publish a case history on someone being helped with it which would may be persuade some doctors to give it a try? 5)	In case you need no echocardiogram the consultation as you described it could have been performed with skype? Of course with a partner who catches you if you topple with the Romberg test. OK, enough, hope I did not tier you out just by reading this! I do wish you to carry on improving, and don’t be disheartened if its so slow. The slower the progress the more solid it is. I know somebody who started out as you and 15 years later after steady slow progress she is 80% of ‘normal’. Hi Inge. Sorry to take a few days getting back to you. I had a rough patch of period/a few bad nights of sleep. 1.Yes, LDN helps me with sleep, but no, not enough that it would eliminate other treatments, but just enough that I don’t sleep well if I don’t take it! 2. As for the Vitamin D question, I think I remember that there’s been some research that Vitamin D may help with the flu, which is probably where that recommendation came from. This research was not connected to CFS. Cheney isn’t across the board against Vitamin D – though it tests negative on echo, he thinks low levels of supplementation are probably okay. He would prefer people get sunlight rather than take it as tablets, and has also recommended cod liver oil within the past year. I use Vitamin D2 with his approval because I’m vegetarian and because without supplementing it my level falls into deficiency and I get more pain. 3. I don’t know. I hadn’t heard anything about homeopathic GcMAF myself. Do you have a link? 4. I know I’m lucky he’ll prescribe the Soma. I’ll be interested to see if he’ll have a chance to write about it, but I don’t know if it would make much difference if he did. My GP won’t prescribe it, but it’s because he isn’t permitted to by the hospital system he works within (black market value is to blame, apparently), and I have had other doctors refuse to prescribe it as well. None of those other people who’ve denied me it really seemed to know anything about it, though – I’ve been told things as idiotic as “It turns into heroin in the body!” by people with medical licenses. 5. I don’t think it could be done with Skype, because the physical exam is crucial, but here’s a hopeful note: Dr. Cheney told me at this appointment that he had traveled to see a patient in Ohio! The patient is similarly ill to me, but has a worse time with vibration and thus isn’t able to travel at all, even lying down. Dr. Cheney said that he was considering that he might do this again in the future – travel to patients – because there are so many that cannot come to him. He told me he couldn’t make a house call in Pennsylvania, as he does not have a PA medical license, but that he could hold the appointment in my local doctor’s office and it would be considered a “consultation,” which would be legal. I don’t know if this will actually happen, but I would love it if it did. I am not holding my breath, as there are always things that are new each year that don’t pan out by the next time I see him – I suppose it’s the price of him trying to be open-minded, on the cutting edge, and share his thought process. And thanks for the hopeful thoughts! I do seem to be making progress year over year – compared to where I was in 2008, I’m quite happy! As long as the sleep drugs work, I hope I’ll keep making such headway. I am so sorry that you had a few bad night – they eat into whatever activity you otherwise can do, i know this so well! Therefore double thanks to make the effort to reply. 1) Yes I thought so, LDN helps people with sleep who are not as insomniac as we. It’s just like my arsenal of amino acids and herbs. I sleep a bit worse when I run out of a tab but it never helps on it’s own. 2) Thanks to clarify the Vit D question. Did it help you lowering the dose with the cytokine storm? What level of vit d does cheney think is the minimum we can get away with without supplementing? If I take 2000iu I hover around 30 ng/ml which my naturopath thinks is too low and wants me to take 4000iu to reach 50 ng/ml which he thinks adequate but he does not know enough about our weird metabolism. I had my levels checked regularly since 2008 after Summer and Winter and although I can tolerate to lye in the sun my skin tanns less with every summer and taking less vit d in Summer makes my level of vit d fall lower despite the sun exposure. May be thats getting older, I am now 63.
and http://forums.phoenixrising.me/showthread.php?17364-Dr-Bradstreet-new-post which gives a link to dr Bradstreets blog. He uses homeopathic GcMaf for his autistic patients and some months ago travelled to the Ukraine for a different kind of stem cell therapy than the one Cheney tried. But he has good results with GcMat on its own. Of course autism is quite different from ME but has similar immune components. 5) I cross my fingers for you that Cheney comes to your GP practice next year! Thanks, Inge, I’m on the mend now. As to the cytokine storm, I don’t know if dropping the vitamin D helped or not this time. I know that last time, when I was having IRIS, I hadn’t been taking D because Cheney told us not to take it while on GcMAF. So I had been off the D for a while, and once it’d been a number of weeks since I’d stopped the GcMAF, I decided it might be time to add in the D again. So I did, and I noticed that it made my IRIS noticeably worse! So I think there is a connection – lowering it won’t necessarily stop the cytokine storm, but taking it might make matters worse. Cheney has not given me a number as to what is too low. But I’ve been tested in the high 20s when supplementing, and he’s been fine with that. I checked out the PR thread. I have to say, I’m pretty skeptical of homeopathy in general, but I don’t know if that skepticism applies here, because I don’t know how they’ve prepared the remedy that they’re selling. I mean, you take tiny, tiny doses of GcMAF anyway, so maybe diluting it to a crazy degree would be fine. So I can’t really weigh in on that. I hope you’re progressing. Wanted to say that my proofreading skills are better than ever. I notice mistakes even in the New York Times and in books I’m reading. Mistakes just pop out at me. (It’s almost a “savant” thing.) However, what suffers is my writing. I can’t retain information, so when I write something factual I have to write down everything from sources in my document and then work from that. Also, I can only think on the page. So I have to write everything down. If I have to write something of 700 words, it starts out 2000 words, then I cut and tweak forever. And my creativity suffers. When I really get tired, the first words of each paragraph start sounding the same and it’ll often be “They said,” “They did,” My creativity goes down the drain. Yet I’m a word person, love crossword puzzles, reading books and newspapers and mystery book blogs, etc. Yet I can see how tired by my writing, even at blogs. I repeat points, words, etc. I am still not sleeping well since gave up 1/2 of an Elavil due to rapid heart beat. So many days I sleep 2 hours and then 2 hours and that’s it. Hope you are improving since your trip. Thanks, Kathy, I do feel like I’ve pretty well recovered. The feverish feeling is still hanging around, but it too is improving. I have similar difficulty with writing and approach it in a similar way! I used to be great at constructing a piece of writing from beginning to end in longhand, but ever since staring to regularly use a word processor in college, I’ve gotten worse and worse at it. I just am not as disciplined about organizing my thoughts in advance, and because I can cut and paste, and elaborate into and then prune off digressions here and there, I do. It’s disconcerting, though, to look at a homonym and have to really think about it. My other word thing is Scrabble. That’s something I’ve started to be able to do just in the last few months that I couldn’t do before! I’m slow at it, but I win a fair number of games. Sorry to hear you’re still struggling with the sleep. I didn’t have any success with Elavil either – it gave me some weird and unpleasant dissociation. How many new things have you tried lately? Jocelyn, I’ve had this post up on my reader for days now trying to find my way thru the brain fog just enough to comment! I am finding your experiences with Dr Cheney to be fascinating, and thank you for reporting in such detail. I’m so sorry you had that cold wiping you out even more during your trip. But you did an awesome job writing about it anyway. I hope you’re feeling at least a little bit better by now. Thanks, Ash. I am feeling better (although I’m replying late here because I had an off week last week). Yes, my sympathies on the temperature intolerance. The heat is the worst – it’s so scary to know if the power goes out during the summer that we’ll have to haul me to a hotel. My heat tolerance didn’t use to be so bad – I used to be able to deal with up to 80 or so, but for the last four or five years it’s gotten down to 72. Of course, when I fell ill, we were living in Fresno, where it’s 100 degrees plus or minus five degrees for half the year – and I just hated that. I’d so much rather deal with cold than heat. What an idea! A ME/CFS nudist colony? The mind boggles. I am another one who suffers horribly from the heat, end up closed into my a/c bedroom all summer, almost fainting walking to other rooms, can’t go out, live on frozen ices. However, one thing is I mail-order clothing from Deva because I can’t tolerate chemicals in clothing and they have none and use low-impact dyes. Anyway, they have very light-weight sleeveless tops for summer, which almost feel weightless. I wear those and shorts or capri pants from that store. I start in May and end in October with the summer clothes. I have shocked others with my nonfunctioning thermostat. My friend Michelle & I have tossed around the idea that it would be so great if there was an actual physical community, maybe a couple big houses with some land to insulate us from road sounds & lawnmowers & stuff that drives us wonkers… a place where we wouldn’t be facing the cost & physical toll of upkeeping on a home all by ourselves, and where we can each contribute whatever we are able to physically, emotionally, etc. We can teach each other the arts & crafts that keep us sane, too. With all of us on limited income, it would make sense financially to share to costs of having a place to live. I think it would be good for our caregivers, too, since they could share the chores, and emotionally support each other. And all of us who are heat-intolerant can move around with whatever makes us most comfortable on – or off! It’s good to dream. With more & more ME/CFS patients every year, maybe one day it will become reality. It would be great if there was an intentional community, or a bunch of intentional communities, for people with illnesses like ours. I sort of wonder if more of that’ll emerge as more of the Baby Boomers start dealing with the effects of getting older – more different kinds of support for people with chronic illness. You’re right, there are too many people out there struggling through on too little money and too little energy. When Chimp and I were living in Fresno, there was a shared community that was in the planning stages – I talked to the people who were heading it up, but we didn’t end up jumping in, because it was going to be an owned community rather than rentals, and at that point I was already sick, didn’t know if we could manage the commitment, and definitely thought we didn’t want to stay in Fresno. But something like that would be great for people who are a bit more well and those a bit more sick – the bit more wells could interact more, and the bit more sicks could get the support that they need. I think of my friend Danny, who’s young but in a nursing home because there’s no good facility for someone like him – and he’s not getting the treatment he needs because that sort of place isn’t equipped for his needs. In reality, the moodiness, crankiness and sudden loss of patience and also total exhaustion would be awful — for me, anyway — to inflict on other people who are sick. It’s good if I can crawl into my cave and read and watch tv and vegetate. I think we’d all need a good personal cave. But who better than people with ME/CFS to plan out the sort of total sensory rest facility we’d need? Exactly! I think almost all of us refer to our bedrooms as our caves, and they’d have to stay that way. Insulated walls to protect from sounds. When my head is at its worst, even the sound of the door opening or the beep of a cell phone makes me jump out of my skin. So definitely insulated personal spaces. I’m sad for your friend, Danny. For a while there, it seemed to be mostly people my age (48) plus or minus five years. But now there are more and more younger people like yourself. The children of many of us “older” patients are hitting puberty, and being struck down hard with it. I can’t imagine being less than 40 and put into assisted living with almost all seniors. Plus those places can be so incredibly noisy! I don’t think healthy people (like nurses) can even comprehend what even the tiniest sounds do to us, but our caregivers know. It’s certainly something to think about, even if it doesn’t happen for a decade or more. That’s awful about your friend Danny. Sometimes when I really feel overwhelmed, like I can’t accomplish basic things, like food shopping or cleaning or get confused about something, I start thinking I should do something like that. But the reality of the situation takes over and I just do what I can. I am not sleeping well. Actually 1/2 of an Elavil with a few other things helped me sleep much better. I slept for 4 hours, then was up for a few hours, then slept for 3 hours more, deeply. I had to stop it because my heartbeat was too fast. (I’m noticing iced coffee is doing the same thing.) But without it, I sleep for 2 hours and every sound wakes me up. I almost screamed at the custodian next door because the garbage (cans, bottles) are kept outside and he deals with this stuff in the morning, moving it around, repacking it. It is impossible for me to deal with it. I’ll have to get out the ear plugs. This disease is so complicated. I forget all of the time to listen to my cds, think of it when I”m not home and never do it. Now I’m having problems with new cordless phones. I’m ready to go back to the Pony Express. Was high-technology meant for people with ME/CFS? I mean, it’s like rocket science here.